Capcom announced an official 3v3 league for Street Fighter V during the game’s Premier event at the 2018 Tokyo Game Show – and there’s more to the new circuit than meets the eye. In a press release announced following the Tokyo Game Show, Capcom revealed that its 3v3 league – simply dubbed the ‘Street Fighter League’ – is aiming to do more than bolster the game’s competition. Instead, the League is looking to grow Japan’s esports market as a whole by increasing Street Fighter V’s competitive player-base. 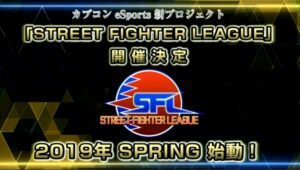 The release states that the League seeks to expand opportunities for both existing competitors and newcomers alike, and hopes to introduce more fighters to the game’s esports scene through this expansion. In addition, the company will use its ‘Single Content, Multiple Usage Strategy’ to boost the value of its Street Fighter IP and ‘enhance’ SFV’s performance in the marketplace. Capcom announced in early February that 2018 would mark ‘Esports Year One’ for the company, and their plan seems to be holding true thus far. The business launched its Capcom Esports Club in Japan and continues to support the Capcom Pro Tour, making notable changes to its points structure for the 2018 season. Capcom itself provided competitors with Japan’s largest esports winnings during the Tokyo Game Show, supplying over $90,000 in prizes. With the implementation of the Street Fighter League, Capcom seems to be getting a leg up on other esports in the region – and providing even greater means of competition for their players. The League will launch in Spring of 2019, and will allow both JeSU licensed and unlicensed competitors to take part. However, those without a JeSU license will be unable to earn more than 100,000 yen ($895) due to the country’s gambling laws. The League will feature a limited amount of six teams with three players each, a la King of Fighters: Although no mention of the game’s Team Battle mode has yet been made, use of the mode would fall in line with the title’s recent influx of new content. While the League is exclusive to Japan, there’s no telling if it will make its way to the states, as it does not affect players’ standings in the Capcom Pro Tour. However, team tournaments have been a staple at many major events throughout the series’ lifetime, and giving some legitimacy to the format could spell serious profit for both Capcom and SFV’s players in the future. Capcom has made concentrated efforts to boost SFV’s content throughout the month of September. With the game’s brand-new Dojo mode, a plethora of additional costumes, and Fighting Chance mode, SFV is amping up to be the series’ most ambitious iteration yet. More information concerning the League will release in October. Until then, fans are left to speculate on its details – and build fictional teams of their favourite Japanese players.